Race helmet design 47 is a Bell GP3 race helmet I designed and painted for Derek Grover, very interesting, detailed, fun design to paint. 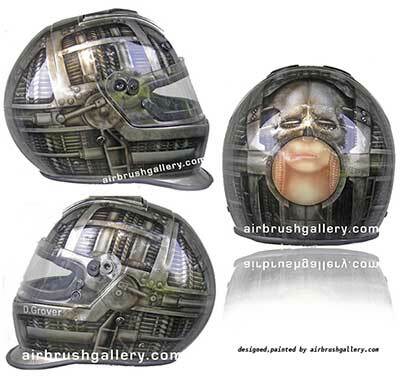 This is an original race helmet design by helmet painter Don Johnson. This is my favorite style of race helmet design, it just to seems to fit in with the machine a race car is. Derek wanted the ELP picture incorporated into a race helmet design the rest I came up with myself. Like This Herlmet Design Share It With Friends, Choose Your Platform!